Auteur See File history below for details. Tiếng Việt: Đối với Việt Nam Dân chủ Cộng hòa (Bắc Việt) từ năm 1955 đến 1976, xin hãy dùng hình File:Flag of North Vietnam.svg. English: For Democratic Republic of Vietnam (North Vietnam) purposes between 1955 and 1976 please use the File:Flag of North Vietnam.svg. Italiano: Per gli scopi della Repubblica Democratica del Vietnam (Vietnam del Nord) tra il 1955 e il 1976 usare per favore il File:Flag of North Vietnam.svg. 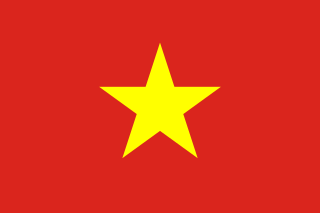 Français : Pour la République démocratique du Vietnam (Vietnam du Nord) fins entre 1955 et 1976 s'il vous plaît utiliser le File:Flag of North Vietnam.svg. 中文: 對於越南民主共和國（北越）1955至1976年，请使用File:Flag of North Vietnam.svg. huidige versie 26 jun 2017 16:09 900 × 600 (283 bytes) DragonflySixtyseven that's the flag of the former state of South Vietnam. This is the flag of the *current* state of Vietnam. 6 mrt 2017 05:52 900 × 600 (511 bytes) Zscout370 Reverted to version as of 14:11, 19 May 2012 (UTC) the 1992 regulations supercede the 1977 standard I found (I was wrong). Going to correct size, but keeping the smaller code.